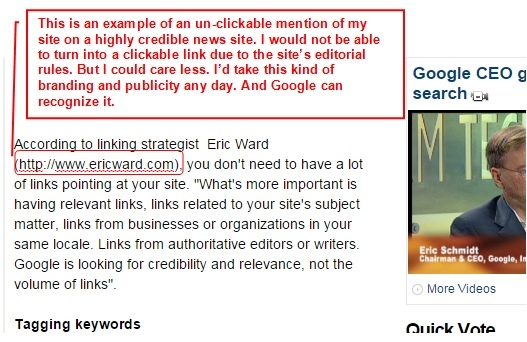 In 2009 or 2010 at SMX East, I answered an audience question about unclickable URLs. I told the audience that I although I had no proof, I felt Google could easily spot URLs that were not clickable. This seemed pretty simple to do. But do these unclickable URLs have any value? Having a URL on a high-value page is a great thing, regardless of clickability. And even though Google’s John Mueller has stated a text only URL cannot *PASS* signals, what’s more important to know is can that text URL *RECEIVE* signal value from the page that placed it there? I don’t have the answer, but here’s a classic example: I’ve been quoted before on other sites. Sometimes it’s in an article by a well-known news site, similar to this example below. See how my site URL complete with http:// is included along with my quote? Here’s a screen grab. Notice that the URL of my site is not clickable, because back then (and perhaps still now), this news site had a policy of not linking out. Now put yourself in Google’s position. If a trusted news site is including unclickable URLs in an article, some pretty solid author vetting likely took place beforehand, and this news site also indicates credibility. Journalists don’t cite crap. One last comment. When you are on a page with an un-clickable URL and mail it to someone, all email clients turn that text URL into a clickable link, Gmail included. Hmm. Just a little food for thought. I’ve never worried about whether I earned a link or text URL. The inclusion of a credible source sometimes outweighs clickability.